It only takes a moment on the 8.21 Southwest Trains service from Clapham Junction to Teddington for me to realise just how much I use the Kriega R25 backpack. For the past five months, the Kriega R25 has carried my camera, laptop, books, holiday gear, badminton stuff and general work related paraphernalia with me pretty much on a daily basis. The 25 litre Kriega backpack replaced my previous, long lasting North Face Jester backpack which boasted an impressive 10 year life. The ever increasing size of the hole in the bottom was the main decision to switch from North Face to Kriega. 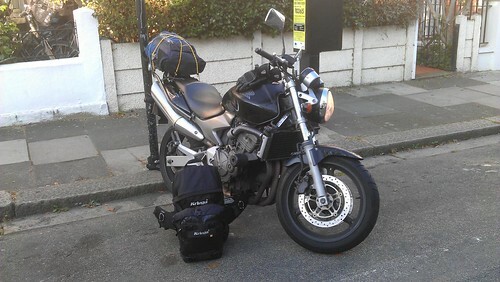 I went for the R25 mainly because of Kriega’s patented quadlock harness. By bringing the straps together in the middle of the chest it takes the weight off your shoulders for easier use of your arms and shoulders whilst motorcycling, which also means that the straps are longer and therefore proves much easier access for putting the backpack on and taking it off. The harness is also very easy to close and open, and the length adjustment system which Kriega have implemented on the R25 is easy and quick to use. It’s essentially a backpack which is designed for motorcycle riders. When you’re riding a motorcycle on a daily basis you need something dependable, functional, capable and flippin’ easy to use. This ticks all of those boxes for me. One of the few things which I had difficulty finding out when searching for product reviews before I bought it was how waterproof it is. Kriega do waterproof backpacks and others which aren’t, so does that mean that they let all of the water in? In short, experience so far with the bundles of rain a classic British summer delivers is no. The straps tend to absorb the water which although annoying, isn’t the end if the world. The rest of the backpack tends to collect some of the water which you can see beading on the surface, and absorbs the rest. The inside of the backpack hasn’t got wet, yet. I did have the intention if attaching a Respro waterproof reflective backpack cover to the R25 if it wasn’t waterproof enough – I don’t plan on getting one anytime soon, although it might be a good idea for high visibility during winter commuting. The main and pretty much only issue I do have with the Kriega R25 backpack is the zip. Whilst the material overlap is sufficient and it does what it needs to, i.e. keeps the contents inside the bag with overlapping material to keep water out, the zip often gets trapped with the overlapping material and it never seems as though I’ve completely closed it. Having said that, even though the zip does catch on a regular basis, I’m confident that it won’t tear itself apart! 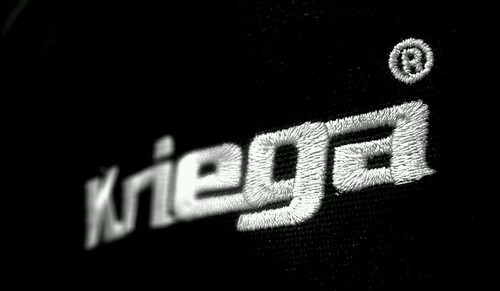 The guarantee which comes with the backpack from Kriega is enough to keep me confident. On the whole, this is not only a motorcycle backpack which i use when commuting, but one which i use for everything. The harness which takes the weight off your shoulders and places it on your chest and hips makes it so much easier to carry anything. I get a few blank stares from people who walk past me in the street when they see me wearing what looks like a parachute, but the benefits of carrying stuff more comfortably completely outweigh this. I certainly believe that Kriega should be selling the technology to people to make cases for musical instruments – I can imagine those are some heavy bits of kit. I do have a fairly small upper body frame compared to your typical motorcyclist, so I am probably on the smallest setting for the straps. So I would say don’t buy this for a child or young adult. But when I have my jacket on, there’s no problems at all and the harness is really easy to tighten and adjust to fit you. Fantastic piece of motorcycling kit. If you’re in need of a new backpack, buy one.